Arts & The Mind re-aired September 3, 2014. Alzheimer’s researchers call it a powerful tool to ward off dementia. At-risk teens use it to find meaning in the world around them—and in themselves. It offers healing to both chronically ill toddlers and veterans battling PTSD. What is this magical elixir? Art. Arts & the Mind explores the vital role the arts play in human development during both youth and older age, and shares stories and cutting edge scientific research on how music, dance, painting, poetry and theater markedly improve well-being at both ends of life. 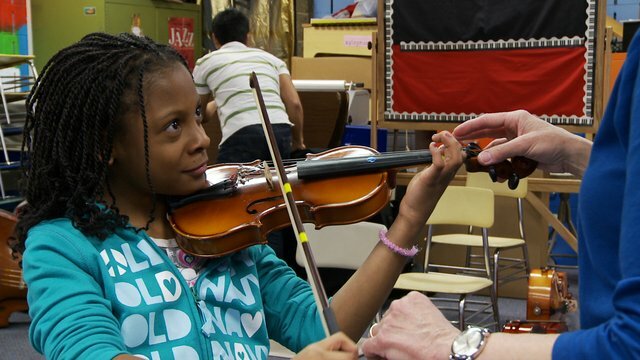 Participant in Baltimore Symphony conductor Marin Alsop’s renowned OrchKids Program. Weaving together stories from childhood and older age into two one-hour documentaries, Arts & the Mind journeys across America, showcasing some of the nation’s most innovative and successful arts programs plus revealing the insights and work of leading American neurologists, psychologists and educators. Arts & the Mind looks at how the arts can improve children’s school performance and build both creativity and competency - featuring stories from the Inner-City Arts program in Los Angeles’s “skid row” and Baltimore Symphony conductor Marin Alsop’s renowned OrchKids Program; how teenagers find meaning and hope through poetry at Get Lit, an L.A. program run by actress Diane Lane and supported by actor Tim Robbins; how music binds the generations in Appalachia; How the multi-generational Kairos Dance Theater in Minneapolis brings together dancers from 9 to 90, and whose Dancing Heart program provides stimulation and inspiration to those in nursing homes; and how New York City’s Museum of Modern Art “Meet Me at MoMA” program makes the arts accessible to people with dementia. The multi-generational Kairos Dance Theater in Minneapolis brings together dancers from 9 to 90; its Dancing Heart program provides stimulation and inspiration to those in nursing homes. Throughout Arts & the Mind, experts provide scientific context. Researchers include; Dr. Antonio Damasio (University of Southern California), Dr. Ellen Winner (Boston College), Dr. James Catterall (UCLA), Dr. Charles Limb (Johns Hopkins Medical Institute) and Dr. Peter Davies (Albert Einstein Medical Center). Each reveal the latest research on the impact of the arts on human development; why the arts improve children’s learning and achievement in school; and evidence to confirm how the arts keep middle-aged and older brains agile and alert. Included in these sections will be the latest medical imaging techniques that illustrate their findings. Arts & the Mind is a production of TPT National Productions and Eaton Creative. The writer, producer and director is Leo Eaton, the editor is Barbara Ballow, and executive producer is Gerry Richman. Own this DVD that explores the crucial impact of the arts on the human brain across our lifetime.